Parallels CD (2003) NEW Title: Parallels Genre: General|tbc Format: SACD No. of Discs: 1 disc(s) Studio / Label: Chesky UK Release Date: 10 Mar 2003. 1 8 Subconscious Lee. 1 6 Palo Alto. 1 5 317 East 32nd. 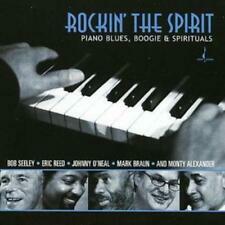 Title: Rockin' The Spirit - Piano Blues, Boogie and Spirituals. Pinetop's Boogie - Mark Braun. Boogie Keys - Monty Alexander. Bob Seeley (piano). Eric Reed (piano). Johnny O’Neal (piano). Mark Braun (piano). Lenny White/Buster Williams/George Colligan/Steve Wilson : Hancock Island: TheTitle: Hancock Island: The Music of Herbie Hancock Artist: Lenny White/Buster Williams/George Colligan/Steve Wilson Genre: Jazz|Jazz Format: SACD No. Of Discs: 1 disc(s) Studio / Label: Chesky UK Release Date: 26 Feb 2007. Disc 1 7 Beauty and the Beast. Disc 1 8 Miyako. Disc 1 6 Masqalero. Disc 1 5 Witch Hunt. Disc 1 4 Teru. Disc 1 3 Footprints. David Hazeltine : Jobim Songbook in New York, the [sacd/cd Hybrid] CD (2007)Title: Jobim Songbook in New York, the [sacd/cd Hybrid] Artist: David Hazeltine Genre: Jazz|Jazz Format: CD / Album Type: CD No. ORIGINAL HYBRID SACD ALBUM ALSO PLAYS ON NORMAL CD PLAYERS. Format: SACD. The Good Life. Put On a Happy Face. The Way You Look Tonight. Classic Artists. Rare Collectables. Maybe September. Label: Chesky. Format: SACD. Cantaloupe Island. Sale Corner. Classic Artists. Good Life, the [sacd/cd Hybrid] CD (2008) NEW Title: Good Life, the [sacd/cd Hybrid] Genre: General|tbc Format: CD / Album Type: CD No. of Discs: 1 disc(s) Studio / Label: Chesky UK Release Date: 26 May 2008. Format: SACD. Artist: Phil Woods. Title: Here's to My Lady. Here's to My Lady. Yours Is My Heart Alone. Genre: Jazz. Visions of Gaudi. Charles Christopher. Artist: David Hazeltine. Title: The Jobim Songbook In New York. Format: SACD. Condition: New. One Note Samba. Quiet Nights. Once I Loved. Format: SACD. Artist: Louise Rogers. Title: Black Coffee. Black Coffee. Be My Baby. Ain't Misbehavin'. Genre: Jazz. Alright Okay You Win. Artist: Beat Kaestli. Format: SACD. Title: Invitation. The Island. My Foolish Heart. Label: Chesky Records. It Could Happen to You. Artist: Xiomara Laugart. Title: La Voz. Format: SACD. Son de la Loma. Condition: New. Release Date: 2010. A Orado Encuentro. Artist: Javon Jackson. Format: SACD. Title: Sugar Hill: Music of Duke Ellington. Prelude to a Kiss. Genre: Jazz. Chelsea Bridge. Release Date: 2007. Artist: Ars Antiqua Austria. Format: SACD. Sonata: Adagio, Presto, Adagio, Presto, Adagio. Balletto Di Matti - Aria 2: Bergamasco; Canario (Presto); Gavotte (Adagio); Sarabanda; Aria 3. Genre: Classical Composers. Artist: Mongo Santamaria. Title: Mambo Mongo. Mambo Mongo. Format: SACD. Caribbean Sunrise. Ninos Del Mundo. Label: Chesky Records. Release Date: 2003. Format: SACD. Title: Unauthorized. Baby Who Are You. Far Worse Off. Won Gon Ju. When Kafka Was the Rage. Title: Caminho de Casa. Artist: Herbie Mann. Format: SACD. Anima (Soul). Seu Corpo (Your Body). Gabriela's Song. Artist: The Conga Kings. Poco Loco - the Conga Kings, Phil Woods. Tin Tin Deo - Chocolate, the Conga Kings. Caravan - Jimmy Bosch, the Conga Kings. Tumbao de Tamborito - the Conga Kings, Mario Rivera. Artist: Babatunde Olatunji. Format: SACD. Title: Love Drum Talk. Love Drum Talk. Don't Know Why My Love. What's Your Number, Mama?. Artist: Ari Hoenig. Format: SACD. Title: Jazz Side of the Moon. Genre: Jazz. Condition: New. On the Run, Pt. Great Gig in the Sky. Artist: Caspar Richter. Format: SACD. Title: Musical Goes Symphonic. I Can Cook Too. A Simple Song - Orchester Der Vereinigten Buhn, Bernstein, Leonard. Format: SACD. Artist: Clark Terry. Title: Portraits (Hybrid). Jive at Five. Little Jazz. Finger Filibuster. Autumn Leaves. Artist: Bernhard Klee. Title: Great Opera Choruses By Wagner & Verdi. Format: SACD. Tannhauser: Act II, Scene 4 Chorus - "Freudig Begrussen Wir Die Edle Halle". Lohengrin: Act III, Scene 1 - "Bridal Chorus". Artist: Chuck Mangione. Papa Mangione. Format: SACD. Attributes: Hybrid SACD. Title: Everything For Love (DL). Genre: Jazz. I Do Everything for Love. Condition: New. Artist: Carlos Franzetti. Format: SACD. Last Year's Waltz. Quiet Rising. Genre: Jazz, Brazilian. Very Early. Label: Chesky Records. Artist: Coryells, Larry Coryell. Title: Coryells. Format: SACD. Trouble No More. Love and Happiness. Low Lee Tah. Sink or Swim. Goodbye Porkpie Hat. Artist: Carla Lother. Format: SACD. Flow My Tears. Black Is the Color. The Song of Wandering Aengus. Captain Courageous. Artist: Lee Konitz. Format: SACD. Title: Parallels. Subconscious Lee. How Deep Is the Ocean?. Artist: Candido & Graciela. Title: Inolvidable. Inolvidable, Pt. Format: SACD. Quien Eres Tu. Tu Mi Delirio. Amor Ciego. Vida Es Un Sueno. Artist: Paquito d'Rivera. Format: SACD. Title: Tropical Nights. Tropicana Nights. UPC: 090368020864. Old Miami Sax. Cicuta Tibia. Artist: Paquito d'Rivera. Format: SACD. Title: Portraits of Cuba. Portraits of Cuba. Excerpt from "Aires Tropicales" [Excerpt]. Genre: Latin Jazz. No Te Importe Saber. Tu, Mi Delirio. Artículo dañado o defectuososerá reemplazado sin costo alguno para usted. Second Hand. Help & InfoHelp & Info. Japan Import. Format: CD. CategoriesVinyl CD DVD Blu-Ray MC/Cassette. Los gastos de envío para la restitución a su cargo. Artist: Clark Terry. Title: Portraits. 1-10 I Can't Get Started. Condition: New. Missing Information?. 1-8 Ciribiribin. 1-7 Jive at Five. 1-5 Little Jazz. Title: Inolvidable [sacd/cd Hybrid]. Format: CD. Missing Information?. Condition: New. Genre: General. Title: Mysterious Shorter [sacd/cd Hybrid]. 1-7 Beauty and the Beast. Format: CD. Condition: New. Missing Information?. 1-5 Witch Hunt. 1-3 Footprints. 1-2 Tom Thumb.